← Maybe THIS is the saddest sign in the region? FOBIF is well aware that Fryers Ridge Road is a major fire access track for the area. Our problem with the current works is that we believe that the desired safety result could have been achieved in a less destructive way–perhaps by selective removal of obstructive vegetation, and some slashing. 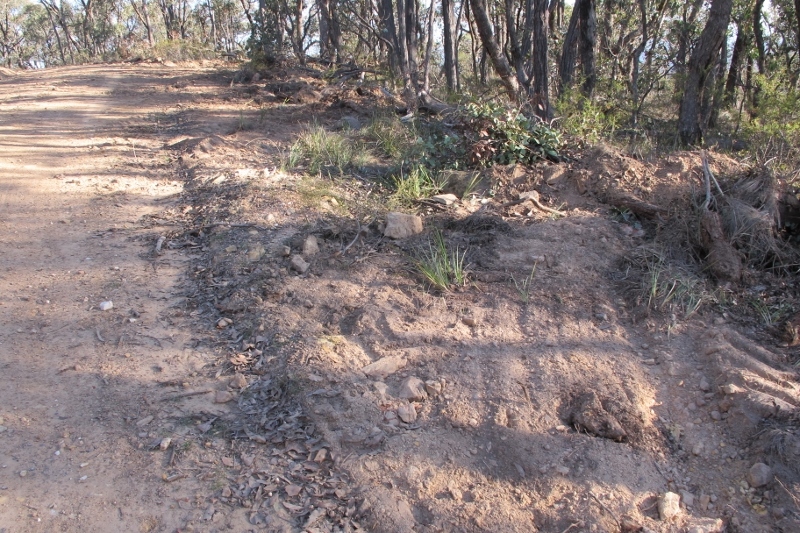 Scalping and bulldozing of road verges has a severe impact on vegetation in the long term: field naturalists with long memories of the district have claimed that Department works over the last 50 years have reduced some sections of the roadway to a shadow of their former glory. Fryers Ridge: managers concede that scalping is not ‘ideal’. It appears that better methods are too expensive for the Department’s budget. FOBIF representatives met with DELWP and Parks officers on the ridge on July 10. These conceded that the works ‘could have been better done’ in places. The reason they weren’t? Shortage of money. The preferred vegetation management methods cost more, and from where we stand, it looks like the Department is drastically short of money. Hence, repeated cutbacks by governments of both persuasions over the years delivers what we can’t quite get used to: land management on the cheap.